Day 711 - Goodbye, January! So long, January 2008! It sure has flown by! As a matter of fact, I can't believe a month of the New Year has already occurred... Where was I? Oh, working. It is 32 degrees and there is a mixed bag of precipitation falling outside, some frozen, some not. Should be a fun commute this morning. Charlie has a cold and we ignored the alarm this morning. We didn't get up until almost 6:30. I don't leave for class till 7:15, and I haven't had my foame' latte' yet! That is extraordinarily late for me! Charlie just brought in my foame' latte' - thanks, Charlie! No, we haven't mentioned to the class instructor about her 'not so secret' admirer at lunch the other day, but I did mention it to my co-worker, and she had also noticed the guy and his stares. Her comment 'Take a picture, it lasts longer'. Well, sorry for the short bloggage, but I need to get ready to go! Day two of class was successful. Two more days of class and one testing day coming up. I was tired by the end of the day but managed to complete my 'hands on exercise' pages before I hit the road. It took me an hour and ten minutes to drive home last night - but it could have been worse. A funny story about lunch yesterday. Me, a woman that I work with who is also at the training class, and our instructor went to a Greek place down the road for lunch. It was raining pretty hard, so we got a bit wet going and coming back. Our instructor is a VERY petite and tiny young woman who dresses kind of hippie-like. She told us on the way how she makes her own hummus at home, and loves middle eastern food. By the time we finished eating she was physically shaking from cold and damp - no body fat, poor thing. At the Greek place, I noticed an 'absent minded professor' type guy, also rail thin and pale, with rather wild, curly hair - staring at her as much as possible. He had finally spotted his soul mate, (or at least kindred spirit) and could not take his eyes off her. Unfortunately, she was oblivious to his stare, even though he stared at her the entire time we stood in line, ordered our food, and received our food. When we left, he stared at her all the way out the door. Should I have told her??? I didn't at the time, but I could tell her today if I get there early before the other students arrive. Greetings, Bloggy Students! Oh - that would be me. I had a really nice day yesterday! Charlie and I went to work out before class, which was a treat. Can't wait to do it all again today, but it is rainy and that makes traffic much worse. A couple of comments about the McDonalds in East Providence, RI - remember the promotion that you could get a burger, fries and a drink and get change back from your dollar?? I remember that, and I think your change was around 7 or 8 cents. Also, the periodically incremented sign count telling how many millions of customers had been served - I think they eventually changed it to 'millions and millions' served or 'billions and billions' served or something like that. Day 708 - Monday again! I have a week long series of training classes to attend this week across town, but class doesn't start till 9am. I have to pass a test on Friday, by the way... Wish me luck! I am going to leave here about 6:15 and go work out before class. Charlie's leaving early too and working out with me. We'll take two cars of course! I'll make the blogs this week pretty short, so I CAN go work out before class. One funny from Charlie's granddaughter, who is six years old. She was curious about Florida and asked 'Is Florida like other states? Is there a McDonalds there'? Yes, she'll feel right at home in Florida, under the familiar glow of the golden arches. Ha! We had a nice evening with Buddy Joe last night - the 'taco soup' he brought was excellent, and I made appetizers and also ate ONE delicious, delectable bagel, all by myself, no sharing. I have a photo of the bagels but I haven't downloaded it yet. Joe sent me his recipe - I thought it was just a touch hot for me, he didn't think so! I grabbed this recipe for Taco soup off the internet. Sautee onion with vegetable oil cooking spray. When softened, combine all other ingredients and cook until heated through. We've been to swim and run our Sunday errands. I'm on my second load of wash now, and I need to catch up on a few emails and assignments at work before I can 'unclog' my brain and get ready for my training class that starts tomorrow. Warning - expect short blogs this coming week! I am going to 10am water aerobics this morning because I wanted to SLOW DOWN for a minute this morning and enjoy being at home and catching up with Charlie! They postponed our late night project at work yesterday for 2 weeks. I went out for dinner with my manager anyway because we worked till 6pm and were starving. We went to 'Tossed', and I didn't use my check card. I have a little work to catch up on over the weekend before being out all next week at training. I had a surprise phone call this morning from buddy Joe. Guess what? He is coming for supper tonight and bringing BAGELS from that fabulous bagel place I was talking about!!! Yippee! He's even bringing taco soup for part of our meal tonight. Now that's a buddy if you ask me! Gotta go, Folks! TTFN and have a great Saturday! Day 705 - Friday, AGAIN! OMIGOSH, it's Friday already! No, I haven't caught up yet but I might get a lot done today. We have a blood drive at work today. My appointment is at 8:45am. I am going to drink my usual foame' latte' and then skip any more coffee until after I give blood. The best part of giving blood, besides saving lives? All the cookies and brownies and drinks they give you afterwards! I am working late tonight (with my manager and some others) to assist with a project that needs to be done after business hours. Some of us are going out to dinner after work (I think to 'Tossed') before the upgrade starts at 7pm. It's going to be a looooong day. Hey - speaking of long days - Charlie finished his last beekeeping class last night. My son said 'Hey, hope he got A's and Bees' on his class! Congratulations, Charlie! They had a prize drawing after the class was over. Charlie WON another BEEHIVE and a coupon for $20 worth of beekeeping supplies! He is really thrilled, because you're supposed to have two hives rather than one for the best results. I hope our neighbors enjoy the hives as much as we do. Ha! Hey family - you might start receiving honey next fall instead of jam sometimes! I hope so, anyway! Day 704 - What about my pepper?? I loved all the comments about how much weight we women gain while we're pregnant. I know I gained at least 40 lbs with mine! I am reposting my photo of the biggest green pepper ever, because nobody commented about it! Inquiring minds (that would be me) want to know if you have ever seen a pepper any bigger! Charlie is enjoying his beekeeping classes, and is painting his beehive and deciding where in the yard to put it. I need to make this short, because I have a ton of work to catch up on today and tomorrow. I am going to be taking a training class all next week, so I can't catch up then! TTFN and What about my pepper?? Day 703 - Salt and PEPPER? Is this the BIGGEST green pepper you ever saw??? Now that monster was worth 82 cents at the Walmart SuperCenter. That is CHARLIE behind the pepper, and that is Charlie's hand holding it. He has a large hand and the green pepper dwarfs it. I went to a different store last night after work. They had large peppers also, and they wanted $1.99 each for them. SOMEWHERE they are having a really great growing season! I can't believe it's Wednesday already. Jeepers, where is the time going? Charlie enjoyed his beekeeping class last night, and has two more classes this week. Speaking of cravings - I have been craving potatoes, particularly baked potatoes. I USED to crave orange vegetables of any sort, but my craving has recently switched to baked potatoes, skins in particular. Heather - any cravings you care to share from someone who SHOULD have them??? TTFN! Have a nice Wednesday! Day 702 - Twofer Tuesday! No, I have no idea whether it will be a Terrific Tuesday but at least Monday is OVER. The full moon was lovely last night - before the clouds covered it up! I like the brightness of the sky at night when the 'silvery' moon is shining, it makes everything shine. It is 32 degrees and raining - some school systems are closed, I assume due to icing. Our Mediterreanean dinner out was great last night. For starters we ordered fried mushrooms and our friends ordered hummus with pita bread and we shared them. I had a delicious salad (it really was!) with lettuce, tomato, onion, and lots of feta cheese, topped with a large amount of gyro meat and some kind of cracked pepper chicken gyro strips that I've never had before, and thinned-down cucumber sauce for dressing. Only $7.50! I also tried a cup of lentil soup, which was good but rather bland. It needed Emeril to kick it up a notch! Charlie had the special which was grilled chicken and vegetables over rice with salad. TY ordered the special too, but received a completely different meal of grilled chicken strips on rice, no vegetables. They brought him out his missing vegetables upon request! Charlie is attending a beekeeping seminar tonight - Happy Honey, Honey! Ha! Hey Joe - Charlie's going to be at the Wilson County fairgrounds tonight. Hey Joe again - I was awake in the middle of the night last night remembering those gigantic bagels from the bagel place in Mt. Juliet that you guys would bring to work occasionally. Someday I have GOT to go there and buy some (at least a dozen, maybe two) and freeze them individually, taking out just one at a time (or I'll eat them all). They were just about the best bagels I ever tasted, and that is saying something, because I've had hundreds (at least). What was the name of the place, and is it still open, and are they still as good? Inquiring minds want to know! TTFN! Day 701 - Moan-day again! Thanks to everyone who participated in Heather's shower yesterday! I appreciate all your hard work and expect lots of pictures! I had to brush out my errant eyebrow again this morning with my finger, and I bumped my head on the shower wall throwing away a sliver of soap, making a red circle on my forehead. Perfect start to a Monday, isn't it? When I first visited Charlie's bachelor pad years ago - he had a 'soap pile' in the bathroom shower. He would save the various slivers of soap from his bars of soap and compress them into a 'soap stack'. He called it his 'pile-o-soap'. I encouraged him to cease and desist. I don't like 'soap shale'. Do you remember those little wire baskets that you could put soap slivers in and shake vigorously in the surface water of the sink to make suds? I think we used those at school or girl scouts or the farm or camp or all of the above... Lyn or Marcia or Mom, do you remember? We've started a warm up - it is TEN degrees this morning instead of nine, but we're headed to the low 40's today - yesterday it didn't get out of the 20's. We're going out for Greek food tonight - looking forward to it! Day 700 - Frozen 'Southern' Tundra! Hey family - have fun at the shower today! I wish I could be there, but I am not flying into New England until the end of the snow season. Take lots of pictures, and enjoy all that awesome food! Charlie and I went to see the movie 'Cloverfield' yesterday. It's a modern day monster movie. I enjoyed it - or was it the excuse to eat popcorn? If you liked the 'Blair Witch Project' movie, you'll like this one too - it has a little of that feel to it. We'll be watching football today (Go Patriots! ), and watching the season finale of 'Amazing Race' as well. Have a great Sunday and stay warm! It feels chilly in the house this morning - the temperature is 28 degrees and it may stay this temperature all day today. We are supposed to have cold and wind, brrrr! Our internet connection is working this morning, hooray! I couldn't read the blog comments yesterday because we didn't have any access to the web. Have you ever felt like a dream was a 'rerun' of a dream you've 'viewed' before? I had one of those last night - I felt like I had dreamed it before! Let's have some new material, brain! I knocked off quite a few items on my 'to do' list that I made yesterday morning, but sometime in the night I remembered an item I SHOULD have done that never made it on the list! Oops. I'll send email to myself at work as a reminder. Well, I've got to leave in 15 minutes for water aerobics. We might hit a movie later. Have a nice day today and TTFN! Day 698 - Friday, Lovely Friday! Greetings, Bloggy Weekenders! Another Friday has arrived! Hey - all the New Englanders out there, better be thinking about 4-wheel drive vehicles your next car purchase! I am so glad it snows about an inch at a time here in Tennessee. I hope I can catch up on some work related things today before the weekend. I might need to transfer my mental 'to do' list onto paper because it's so long! Confession - after I wrote that, I took out a piece of paper and started writing some of it down. I wrote down 10 items in one minute. Nope - 11 items. No notable dreams the last couple of nights - I 'almost' remember them, and have some bits and pieces, but not enough to make sense! Charlie has really been enjoying his retirement! I can't wait till it's ME! He does some cooking now (chili, meatloaf, and egg frittatas), balances the checkbook earlier, is learning about beekeeping (he has ordered and built a beehive that he'll be putting out this spring), and goes to the health club several times a week. Oops - it's getting late! Have a great Friday and a great weekend! Day 697 - I finally got my red grapefruit! Greetings, Bloggy Thirstin' for Thursdayers! The sweet smell of success (or it is citrus?) is following me this morning. I just finished slicing up a red grapefruit, which I will have AFTER my foame' latte' so my mouth doesn't curdle. Do you remember that I've had a difficult time finding RED vs. PINK grapefruit lately? Well, I finally put my 'pissy customer' hat on yesterday, after buying red ones that turned out to be light pink. A local grocery store has 5lb. 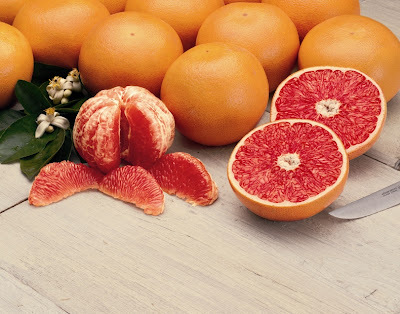 bags of red grapefruit on sale for $1.99 a bag. I went there yesterday at lunchtime. I explained my 'pink vs. red' issue and asked the produce guy to SHOW me the inside of the red grapefruits that were on sale. He hemmed and hawed for awhile, but I hung in there and waited expectantly until he picked up a bag, stuck his thumb in one of the grapefruits, and pulled it open so I could see the fruit inside. Satisfactory. I bought 2 bags. I don't know what he did with the bag he 'mangled', probably brought it in the back to go on the salad bar. You may recall that another grocery store didn't mind at all opening a package of yellow carrots for me to try. Customer service practices greatly depend on which store you go to! Day 696 - Midweek and Midlife - Oh, Joy. Hey, I just thought of something. If I am at midlife, that's not so bad. The trouble is, I think I'm probably PAST midlife. Sheesh. I woke up this morning, went into the bathroom, and looked in the mirror before brushing my teeth, just like I always do. Well - this year is going by fast already. My friend Debbie just booked our FALL Gatlinburg 'Getaway with the gals' trip in November. Once I fill in a few more trip bookings the year will be SET. I haven't decided whether to go away for Thanksgiving this year, for example, and I need to make my summer trip plane reservations. I've already made my reservation for my annual long weekend retreat in Maine at the ocean. My mother and Aunt Nancy will be attending. I'd better get busy working on the agenda for the weekend! Guess I'd better stop thinking about vacation and get ready for work! Thanks to everyone for my birthday greetings - I appreciate it! I still have a couple of presents on the way, so I'll keep extending my birthday as long as possible. I went out to lunch yesterday with some folks from work and had a delicious 'signature' salad at 'Tossed'. The salad had baby spring mix greens, goat cheese, almond slivers, mandarin oranges, mango bits, dried cranberries, and grilled chicken in it. This time I didn't use my check card, so I didn't have to worry about seeing 'Check Card Tossed' in my transaction list. Whew- yesterday was a long day at work. Remind me again not to have birthdays on a Monday. I guess I can't keep up, now that I'm older! Ha! We will have our first snow chance here on Thursday - maybe I'll get to use my 4-wheel drive. It's supposed to be cold all week - highs in the 20's. We had our first propane delivery of the season - nearly $600. Eeek, I'd better put that check in the mail. I'll do that after I post the bloggage. TTFN and have a nice Tuesday! Monday is over! Hooray! Day 694 - Happy Birthday to Meeeee! Greetings, Bloggy Birthday Celebrants (that would be me) and Well-Wishers! Thankfully I won't have another birthday on a MONDAY for awhile! I am glad I could celebrate my birthday all weekend! I just finished opening some presents and cards. I saved several for today even though they came in the mail earlier this week. That, my friends, is discipline! Thanks, everyone for my gifts! I've received a gift bag with various spa goodies in it, a check, a gift card, stamps, a Harry Potter movie, new headphones with a 16 ft. long cord, an over-the-door hanger thing I wanted, and of course my weekend and champagne and dinners out! A couple more items are still en route, so my birthday will last awhile longer. I'll be going out for SALAD at lunch today - I think I should eat nothing but salad for the next couple of weeks! TTFN and Happy Birthday to yours truly! Day 693 - State park getaway a success! Charlie and I just got back from our 'Honeymoon Anniversary' getaway at the Montgomery Bell State Park in Tennessee for my birthday. 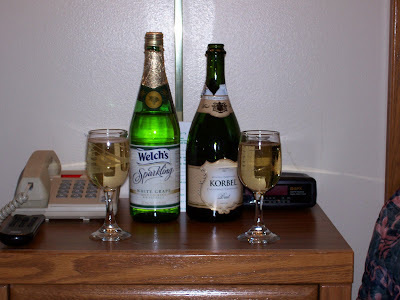 Some of the state parks have a package deal where you get an overnight stay and breakfast for two and a complimentary bottle of sparkling grape juice with toast glasses. Charlie also brought a bottle of Korbel Brut champagne (my favorite), and we mixed the two to sweeten it up a bit. This state park is a 'resort park', which means it has a golf course, an Inn and Conference Center, indoor pool, jacuzzi, etc. in addition to cabins and hiking trails. Pretty nice! We had the dinner buffet last night. They had steak, BBQ chicken and ribs, excellent catfish filets, and all the vegetables and salad stuff you could want. I had cherry cobbler for dessert. This morning we had eggs, bacon, grits, sausage, sausage gravy, biscuits, fresh fruit (I finally got one of those red grapefruit I have been craving), and lots of coffee. This EVENING we are going out for dinner AGAIN to the Santa Fe Steak house in Columbia to have filet mignon. TOMORROW I am going out for lunch with my manager and the other gal who had a birthday this weekend - back to the 'Tossed' salad place. Day 692 - Gotta go to aerobics! Greetings, Bloggy Weekenders and Birthday-Wanna-Be's! I just have time to say 'good morning' then go out the door to water aerobics. I am guzzling my foame' latte' before I leave. This afternoon Charlie and I will be off to a state park, and I think it's going to be a nice day in the low 50's. Day 691 - Friday and Birthday weekend! Greetings, Bloggy Workin' for the Weekenders! We had severe thunderstorms and rain yesterday - some places got over 2 inches of rain. It was nearly 70 degrees. We had a tornado warning at work. The sirens went off in the town, and we all had to crowd into interior hallways until the danger was over. No, there was not a tornado, just conditions that could have produced one. YES, I brought my 'can't live without it' pocketbook with me. I waited in the hall, reading the tornado alert on my blackberry from the weather channel, and stupidly worried more about hail hitting my new car than a tornado hitting our building. Ha! It turns out that we have FOUR people on the team with ALMOST consecutive birthdays. One guy on the team had a birthday yesterday. We skip a day today, then three of us have our birthdays over the weekend or in my case, on Monday. Another team member brought in a birthday cake for us all to share, and I brought some home for Charlie. He ate it as soon as he saw it - no 'waiting till after dinner' for this guy! Speaking of birthday cake - what IS it that grocery store bakeries use for icing nowadays? It tastes more like shortening than sugar to me. Yuck. Charlie is off to TWO boat shows today with another retiree. Two wild and crazy guys for sure! Day 690 - Check Card Tossed? Oh No! Greetings, Bloggy Thirsty for Thursdayers! I just got online to do a bank transfer between accounts. I saw an entry in my transaction list that said 'Check Card Tossed'. What? Check Card Tossed? What did that mean? I left it somewhere? After worrying and wondering about that for a few moments, I realized I had gone to a new salad place down the street named 'TOSSED' a week ago. Duh on me. From Charlie - a dumb criminal went to the police station to file a false report that his cell phone was stolen. The officer taking the report called the number, and his phone rang in his pocket. The one on our local news this morning - a criminal beat, robbed and shot someone, leaving him for dead on the train tracks. The train did hit the victim, severing his leg. HE LIVED to identify the bad guy by a particular ring he wore. The bad guy had killed several other people. That man was not meant to die! Beaten up, robbed, shot, hit by a train, and still identified the bad guy. I'm happy for him. He should sell his story to the movies. Dream update - There was a woman in one of my dreams named 'Suppose'. Interesting name. I also dreamed of walking with only one shoe around some construction to find another place to park my car. (my car wasn't my current car either). Birthday update - I ALMOST forgot that I have to renew my drivers license by the end of the day on Monday! Maybe I'll do that at lunchtime today. Eeek! Day 689 - There's critters in my dreams! It's Wednesday already, time flies, doesn't it? This week has been a tad less crazy than last week. I had a nice swim yesterday after work, it was wild and windy weather yesterday. I had lots of animals in my dreams last night, both cats and dogs. Is that related to my blog complaining about all the animals in commercials? I even had a dream where someone had grilled chicken (which took forever in my dream and still came out slightly underdone), which crackled and popped and got the cat all greasy. Someone had to go bathe the cat (which it would hate), and I noticed in a different dream segment while petting a dog how long and silky it's fur was - freshly bathed! So - animals and baths are the theme of the day, eh? What does that mean? Let's just talk about ME, then, shall we? I have just a bit of a scratchy throat at the moment - feels like a lump in my throat. A couple members of the team have colds - actually one is on antibiotics for strep and one has a head cold. I am not in the mood to catch a cold. Wish me luck! Gotta go! TTFN! I got two magazine subscriptions for Christmas, and I have received my first issue on both of them. Thanks, Mom & Gil! Charlie surprised me for my birthday by making a reservation for a weekend getaway at one of the Tennessee state parks this weekend! It has an indoor pool and a restaurant. We'll have a wonderful time, even if it turns cold again. Thank you, Charlie! Yesterday was windy and mild, like springtime. We tied the record high yesterday (around 70 or so), and may do it again today. Whenever it turns warm I notice ants and flying insects appear out of nowhere. Do they 'defrost' and start moving around or something? Eeek! It's 6:08 - I'd better get a move on. TTFN and have a nice Tuesday! Monday is like the movie 'Groundhog day' - it just keeps annoying me - over and over and over again. The best part of Monday is knowing there won't be another one for a whole week. While I am having an 'annoyed' moment (or day, or week), I was annoyed at three things yesterday involving advertising. Annoyance #1: I was clipping coupons and saw a coupon for 'Tums for Kids' antacids. I was offended. Listen, if a kid is getting heartburn, the kid needs exercise and decent food. Kids shouldn't have heartburn. Annoyance #2: Progressive insurance is trying to get your business by saying they will pay for your PETS injuries in an accident. How about the coverage for the PEOPLE? Is that any good? Annoyance #3: Sponsors that play the SAME commercial over and over again during the show. Do they think we'll actually watch that commercial at least ONCE if they play it over again several times during a football game? Or is it just cheaper for them to show the same one rather than producing more than one commercial? Whatever it is, it's annoying. There - I'm finished with my rant... Just because I'm out of time! TTFN and have a nice Monday if that is possible! Day 686 - Belated Birthday wishes! Belated birthday wishes go out to Tiff (of Phil and Tiff) - her birthday was January 4th and I forgot till this morning. Oops! Hope it was a great day! Three people on my Team at work (including myself) have birthdays coming up. What are the odds that of a team of ten people, 3 of us would have consecutive birthdays; one on Jan 12th, one on the 13th, and me on the 14th. We actually had a fourth birthday Team member. His birthday is the 15th, but HE changed teams so we can't count him anymore. We had a really nice day yesterday at Charlie's family get together. Everyone teased him about retirement, we had lots of great food, and got to catch up on the nieces and nephews and their kids. So - what was the food, you ask? Deviled eggs and various stuffed vegetables. Dates stuffed with cream cheese and nuts. Relish tray with olives and pickles. Cheese, sausage and cracker tray. Hot spinach and artichoke dip (look on the back of a Knorr vegetable soup mix package) with a thick layer of melted cheese on top. Other Chips and dip - several kinds. Ham roll - a rolled and baked bread with chopped country ham inside it. Two kinds of ham - spiral sliced baked ham and country ham, which is much darker and saltier. Marinated salad with cauliflower, red onion, peppers and cucumbers. An apple-bread-pudding dessert (that was wonderful). It was like apple crisp on the bottom, except it had a bread pudding kind of topping instead of the crunchy crisp topping. YUM. Are you full yet? I might have forgotten some items, but that's most of 'em! Changing subjects to the weather - we are going to have a warm up for the next couple of days - today is supposed to be in the low 60's - tomorrow may hit 70. Perfect January weather. Have a great Sunday! TTFN! We are preparing for a family get together with Charlie's side of the family - over 20 people at his daughter and son-in-laws new house in Murfreesboro. We are bringing spiral ham (I need to cut it into easy-serve portions), sausage balls (YUM), and chili with fritos scoops. In case you don't remember - sausage balls are appetizers made with pork sausage, cheese, water and bisquick mix, with some spices thrown in. You roll them into large marble sized balls and bake them in the oven. They are one of my favorites. I bought the 'heart healthy' trans fat free Bisquick. I hope it works! Day 684 - Oh YES, indeedy! Friday! Greetings, Bloggy Workin' for the weekend-ers! So - how is your New Year beginning? Mine is OK, could be better, could be worse. Work has been busy but that's not unusual. Did I tell you about my latest invention? Someone might steal it off the blog, but that's just the way it goes. Do you watch the show 'Chuck'? It's about a nerd who has a lot of top secret information downloaded into his brain. He and his 'friend' conversed in Vulcan for a minute on the show. Hey - speaking of retirement... AARP is sending ME stuff! Back OFF, AARP! Isildur! Throw it into the fire! Destroy it! Nooooooo! Okay... back to reality - gotta go to WORK. TTFN and have a great weekend! No blog today, I've been working from home since 4:30am and have to get ready to leave for work! TTFN and have a nice day. Actually, a lot of people are off until next Monday. Today feels like a Monday, actually. However, since it's already Wednesday, I am trying to think positively and be happy that it's a short week. Did you make any New Years resolutions? I forgot to! I guess I already know WHAT I want to do this year, I just have to DO it. Ha! When we moved to Providence when I was in 4th grade, we'd write our New Year's resolutions on slips of paper, and then toss them in the fire burning in the fireplace. Lyn or Marcia, do you remember that? (Maybe we got that from Disney's Mary Poppins movie). Hey! We had snow flurries yesterday, and it is very cold - 17 degrees with a wind chill of 5 degrees. Brrr... It will be cold for the next few days. After really enjoying the dry-rub ribs we ate New Years Eve, we are considering getting a propane or electric smoker this summer, one that we can keep out on the deck with the grill. I already know that I want the kind having a door with a thermostat on it, with racks to put various 'smokable' items on. It needs to have a water pan and a wood chip box. I want to try smoking chicken and turkey and fish, then I can vacuum seal the items with my handy-dandy Handi-vac sealer. Charlie has so many catalogs that we didn't need to do much work to 'shop around' a bit. Any advice would be much appreciated, though! Day 681 - Welcome, New Year's Day! It's already afternoon, so this will be short. THANK YOU TY and SY for a great New Year's Evening and New Year's Day spent watching football, talking and eating! The appetizers were wonderful, the ribs were incredible, the shrimp-and-cheese-grits divine, and the country ham, egg and cheese sandwiches on Thomas's English Muffins outstanding! You outdid yourselves! What did YOU do for New Years? Was it fun? TTFN! Happy January! Happy 2008!